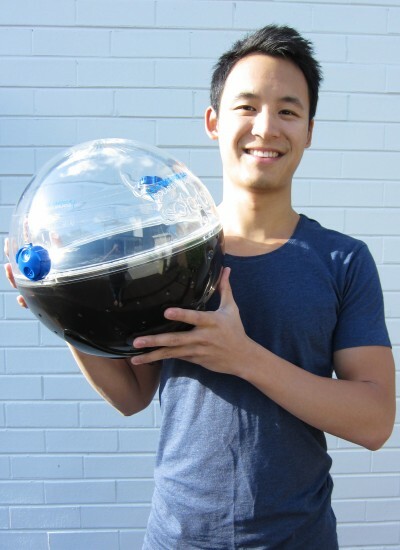 A graduate from Monash university has created an affortable device that works with solar energy. The device developed as Mr.Jonathan Liows final year project during his bachelature on Industrial Design has the the potential to help eradicate deseases and bring clean water to people in need. After visiting Cambodia in 2008 Mr Liows was shoked by the lack of basic products we take for granted and so he was inspired to use his design skills to create something that could help. The spheric device can produce up to 3 days of clean water a day having a potential to provide clean water to the desesperate 900 million people have to face each day and to help the over 2 million of children that die annualy because of contaminated water. The solar ball unit absorbs sun energy and causes the contaminated water to evaporate. When the evaporation occurs ,contaminants are separated from the water creating a drinkable condensation. The result is a condensated clean water ready to use and drink. Mr.Liou was also featured in ABC1 ¨New Invertors¨ and the device was named as a finalist at the Australian Design Awards – James Dyson Award . The solar sphere will also be exibited at the Milan International Design Fair. The novelty of the device that differs from other water purifications objects is that is user friendly ,weather resistant and most amazing of all affortable.